For a romantic and intimate wedding or elopement in a rustic-luxury setting, we at Arenas Foto Wedding Photography recommend you consider Casa El Chante in Tamarindo, Costa Rica. It’s a secluded venue that has great views of the beach, ocean, and hilly rainforest that envelopes its bungalows and infinity pool. Its luxurious, rustic, Balinese-inspired bungalows with similarly fantastic views will leave you and your wedding guests in awe, as will their sites for your wedding ceremony and reception. 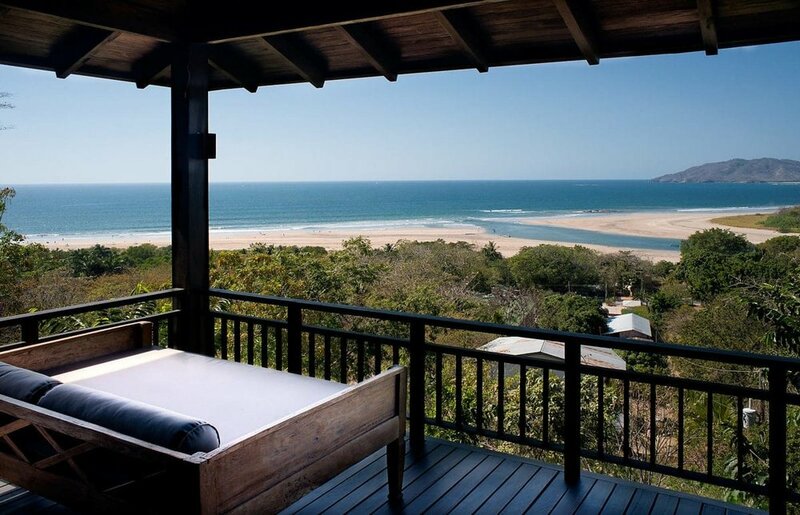 Casa El Chante is located at the entrance of Tamarindo Beach, in Guanacaste Province, Costa Rica. By car, it’s 1-1/2 hours from Daniel Oduber Quiros International Airport (LIR) and 4-1/2 hours Juan Santamaria International Airport (SJO). El Chante can arrange private transport by car from either airport, as well as round-trip air travel between SJO and an airstrip on Tamarindo if SJO is your destination airport. For pricing and further details, please contact Casa El Chante. Common area for lounging or wedding receptions with great beach and ocean views. Casa El Chante is located at the entrance of Tamarindo Beach, in Guanacaste Province, Costa Rica. By car, the bungalows are at 1-1/2 hours from Daniel Oduber Quiros International Airport (LIR) and 4-1/2 hours Juan Santamaria International Airport (SJO). El Chante can arrange private transport by car from either airport, as well as round-trip air travel between SJO and Tamarindo Airport if SJO is your destination airport. For pricing and further details, please contact El Chante. Casa El Chante works with an expert wedding designer/planner who will help you plan the wedding of your dreams. Our planner will work with you through every stage of the planning process and make sure your special event is just as you imagined. They will take care of flowers, music, food, décor, and much more. The gorgeous kitchen where your wedding dinner can be prepared while taking in the great views. Casa El Chante can recommend a hair stylist, makeup artist, and manicurist to help you prepare for your wedding in the comfort of your own bungalow, as well as arrange for spa treatments, from massages to facials, on your big day. Casa El Chante can accommodate 19 overnight guests on your wedding day in its 8 private bungalows. 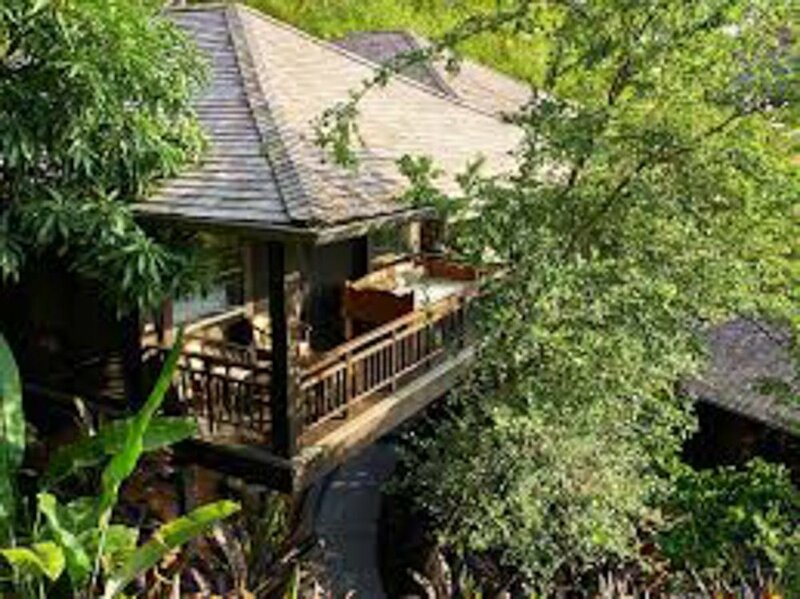 All the bungalows are based on a Balinese design and incorporated into the surrounding forest to create a harmony with nature. The 5 original bungalows having dark brown wood inside and out, whereas the newest three bungalows have dark brown wood outside and white wood inside. To foster a connection to nature and promote natural ventilation, the bungalows have large, screened sliding doors and open-air porches. The bungalows are also equipped with air-conditioners, which is a must when preparing for a wedding in Tamarindo as it can get a bit warm in the summer. Depending on the size of your wedding, Casa El Chante has to marvelous sites with beach, ocean, and mountain views for your wedding day events that can accommodate between 50-100 of your wedding-day guests. Get married with sand between your toes at sunset while the slight ocean breeze coming off the Pacific courses through your hair, all while taking in the fabulous views of the ocean, beach, and rainforest in front of your closest family and friends. You can also tie the knot at the main area at Casa el Chante for wedding ceremonies and reception and still enjoy the fabulous ocean, beach, and rainforest views. Looking for a Luxury Rustic Wedding Venue? Dining room with spectacular views for your wedding reception and dinner. Before and after your wedding, pass the time in its 25 meter long infinity pool while taking in the extraordinary ocean and jungle views, cook on it BBQ grill, hop on its speedy fiber optic Wi-Fi, workout on its TRX fitness equipment, take its longboards, surfboards, and paddle boards to the beach, quench your thirst with purified water from its Vero water tab system, have a massage on a Balinese deck with views of the ocean, or have a yoga session on its gorgeous yoga deck with jungle and ocean views. Casa El Chante can also organize activities and excursions in Tamarindo and beyond, such as scuba diving and snorkeling, sport fishing, horseback riding, ziplining, canopy tours, river boat rides, hiking and walking on nature trails, trips to coffee and cocoa plantations and chocolate factory, surfing lessons, cultural tours, trips to volcanoes, waterfalls, volcanic mud baths and thermal springs and more. What a gorgeous staircase for bride and groom photos at El Chante Bungalows! Breakfast is served daily at Casa El Chante . For your other meals, they can recommend a private chef, or you make your own meals in their simply fantastic kitchen. For your wedding reception and dinner, hire a private chef recommended by Casa El Chante to create a dinner and drink menu that is as amazing as the bungalows. Or, you can work with your wedding planner to cater your wedding that meets all your culinary needs and wants. WHY GET MARRIED AT EL CHANTE - A WORD FROM? Casa El Chante is a truly romantic and exceptional location for your wedding in Costa Rica. It’s located in a private gated community in Tamarindo and has spectacular views of the ocean and beaches and our breathtaking sunsets you and your wedding guests will enjoy and remember for years. You will also love our bungalows, common areas, kitchen, and sites where you can get married. How will you remember your wedding? Want to see more luxury wedding destinations? Find more luxury Costa Rica wedding destinations here!